On Saturday, Mike O. and I played in a tournament in Charlottesville. The tournament was held at the Lazy Parrot Backyard BBQ on Pantops Mountain. A few things about the Lazy Parrott. The owner is a pinball guy who took part in the tournament. He usually has four machines at the restaurant. Also, there are two Lazy Parrots in the same shopping center. 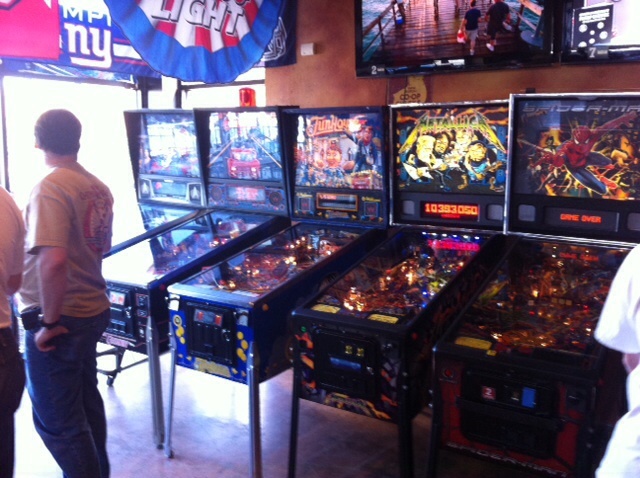 If you go to the Lazy Parrott and there are no pinball machines, you are in the wrong place. I learned this the hard way when I was in Charlottesville the week before the tournament and went to the Lazy Parrott that is pinball free. The tournament was played on these machines: Star Trek the Next Generation, The Getaway, Funhouse, Metallica, Spiderman, Harley-Davidson, Party Zone, Nascar and No Good Gophers. The tournament was a three strike tournament. Each player who comes in third or fourth for a round receives a strike. Once a player finishes in the bottom two of a four person group three times, he is out. I think I counted a total of 19 players in the tournament. I had met some of the players from Northern Virginia when a few of us played in the Fairfax Pinball Open last year. There were some very good players there including the current number seven player in the world, Trent Augenstein. Most of the players were friendly and welcoming. 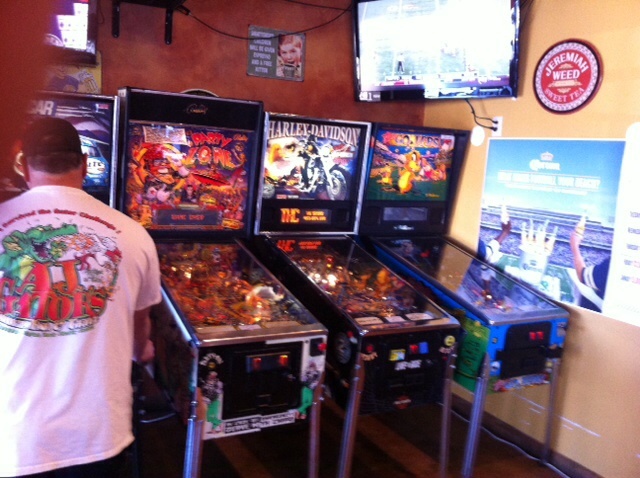 The tournament was set up to encourage new players by waiving the entry for anyone who had not previously played in a pinball tournament. The entry fee was $5 with an optional $20 sidepot for those who wanted to play for a little more money. Four player groups were drawn at random, put in random order and sent to a random machine. All this randomness ended up putting me on the machine The Getaway for my first three rounds. I had seen the machine before and had some idea of the rules, but I had not played this machine prior to the our first round. I was selected to go first in a group that included Mike O (who went last) and Trent, the current number 7 player in the world. I struggled in the first round and received my first strike of the day. One of the highlights of the day was Mike O. stepping up like a boss and taking down the number seven player in the world like it was just another day at the office. Video to come. Mike had it won before he even started his third ball. When Mike finished, he stepped back from the machine and screamed, “That just happened!” in his best Ricky Bobby accent. I think I was actually more excited about Mike’s win that he was. Anyone who has met Mike knows he did not scream after winning, but that’s how I remember it. As I kept grinding on The Getaway through rounds two and three, I finally manage to scrape out a win in round three against two of the Northern Virginia guys. One of the Northern Virginia guys set the GC on The Getaway with over 300 million points. My final game was on Star Trek the Next Generation. I played with Kevin Stone, Justin and Phil. All very nice guys who were friendly and gave me advice on how to play. The game was relatively close between the four of us until Kevin and Justin started and scored in a couple of valuable modes. Kevin was able to start the video mode for which he knew the pattern. He told me the pattern afterwards and I am going to try to get there one of these days. That was my fourth strike and booted me out of the tournament. As the tournament played on, I got in some games on the machines that weren’t in use for the round. I played games on each machine other than Nascar. Nascar was in use for a separate high score tournament and was being played most of the time. The tournament was a very good time and taught me some lessons for future tournaments. I need to be able to warm up before the tournament starts. Even if you know a machine pretty well, each machine is set up differently and I need to get a feel for how that machines is playing that day. I also need a warm up to get the eyes and hands working together well. I was running late from being out of town with my family and arrived at the tournament with just enough time to play one game of No Good Gophers before the tournament started. I also need to know the rules of each machine. As I watched the other players use specific strategies while I flailed around on The Getaway, I knew I should have taken the time to know the rules of the game. I had played Stark Trek The Next Generation many times on the ipad and that knowledge of the rules and shots made me much more competitive than I was on the Getaway. Thanks to the organizers for a great tournament.